Catch the international award-winning festival at Mount Litera School International, Mumbai for the very first time, with over 21 speakers coming from Delhi, Bengaluru, Chennai, Pune, Kolkata and the UK! Please note: Tickets are available at the venue as well. 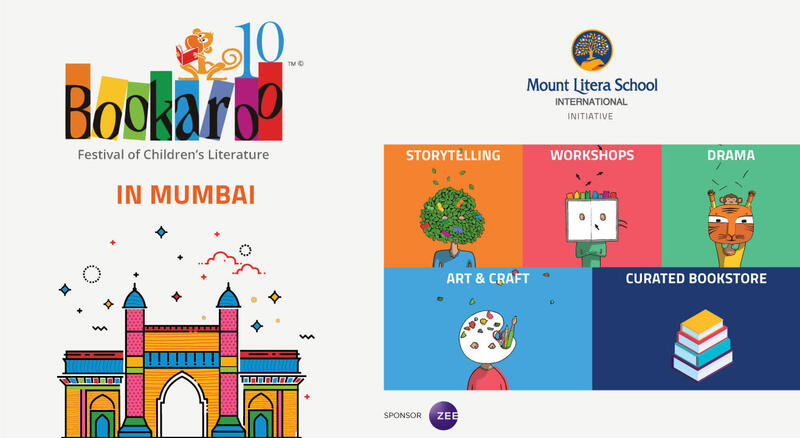 After having celebrated 10 years and winning the International Excellence Award at the London Book Fair last year, the festival makes its debut in Mumbai with its 27th edition with over 50 sessions for children between the age groups of 4-14. Be it stories, non-fiction, poetry, music, drama, drawing, collage-making or clay modelling there is something for every child in Bookaroo. Authors, illustrators, poets, storytellers, arts and crafts people from the world of children’s books will make books come alive at Mount Litera School International on the last weekend of February. Sessions are curated for specific age groups. Registration is strictly by the age-band specified. Scroll below to see details. What's in store at the festival? The Kahani Tree, an enduring element of Bookaroo since 2008, is a huge draw for children. Under it, stories from faraway lands, classics of yesteryear, folktales, grandma’s stories, environment, animal and action-packed adventure stories come to life. Ajay Dasgupta, ChampaSaha, ShaliniTayal, KarishmaMahbubani, Katie Bagli and John Dougherty unravel the magic of stories. For lovers of poetry and music, enjoy some great stories and music with author, poet and songwriter John Dougherty from UK, Potergaan from West Bengal by SumanChitrakaar, Japan’s traditional style of poetry - Haiku and Tanka – with Kala Ramesh, nature, wildlife and ‘environment-friendly’ poems with BijalVachharajani, rap music and anthem writing with KavithaMandana. Those who like to get their hands dirty with craft activities can join Kavita Merchant as she gives shape to clay in her Creative Clay sessions at the Crafty Corner. From masks to creepy crawlies to farm animals she has it all for every age throughout the weekend. If art is what you love, the Doodle Wall gives children of all ages a chance to express themselves from angry birds to squishy jamuns and more. What’s more, you get to see a unique Battle of the Brushes where two artists SavioMascarenhas and PriyaKuriyan slug it out as an unknown story is read to them. Be part of a shimmering tapestry of sights, sounds and stories of Mumbai as PereenaLamba and MielSehgal introduce children to the lesser known facts of the city and display the art for all to see in the session Mumbai Mania. Who knows you may find a fact or two that you too did not know. Watch theatre and film actor KailashWaghmare perform a bi-lingual story in the unique Qissebaazi style in Hindi and Marathi and Padma Damodaran bring English-Malayalam Qissebaazi to children. Join PS Ashwathy as she makes monsoon magical for the children of Mumbai. Even adults can lend her a hand in creating this tactile artwork. Entry is free but pre-registration is mandatory. All sessions are for children only. Books written by the participating authors and illustrators will be on sale at the festival bookstore, Eureka. There will be food trucks to keep those little bellies happy. Check out the list of speakers below.